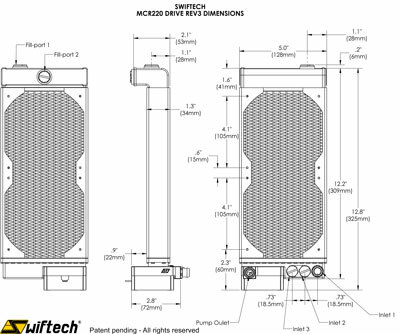 The patent pending MCR-X20 Drive™ series are high performance heat exchangers featuring two truly revolutionary features: a powerful integrated pump with PWM control, and an integrated reservoir. 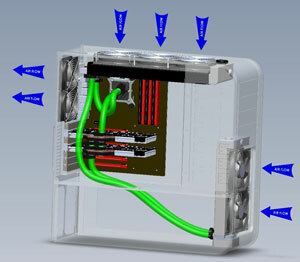 This unique concept is the foundation for a simple, powerful, yet versatile liquid cooling system where only CPU and/or Graphics waterblocks need to be added. Revision 3 brings another level of functionality and performance to this list of ground-breaking features by implementing Swiftech's innovative multi-port connectivity which consisted in adding two more ports (for a total of three) to the inlet plenum. 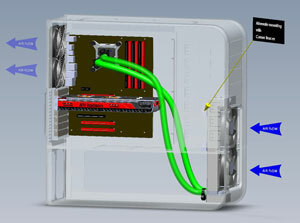 When implemented in conjunction with Swiftech's new Apogee HD™ waterblock, this feature allows dramatic flow rate improvements in complex multi-block environments. 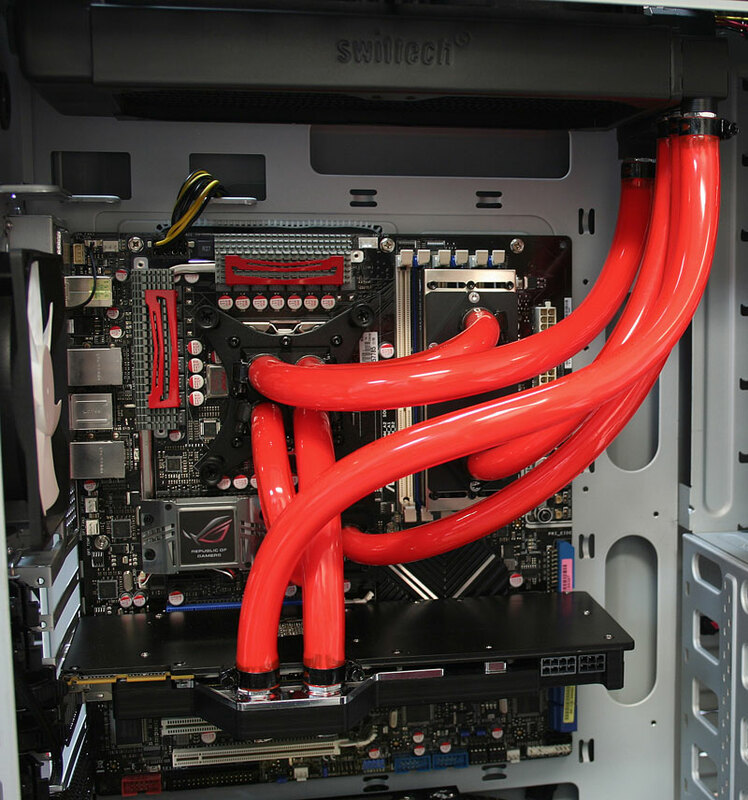 The MCRx20 Drive™ series are also the primary building block for the H20-X20 Edge series of liquid cooling kits. The dual or triple 120mm radiator form factors provide 2 to 3 times the heat dissipation capacity afforded by the single 120mm radiators found in entry level kits. The high-pressure MCP35X pump now runs at up to 4500 rpm, and allows vastly superior system flow rates than comparably sized pumps found in entry level kits, allowing users to daisy-chain multiple water-blocks in the loop. 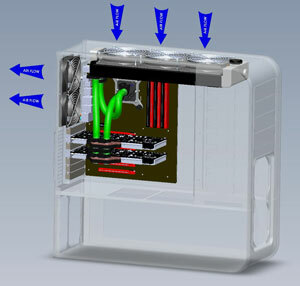 Integration of the pump into the radiator reduces the overall system pressure drop compared to conventional setups. 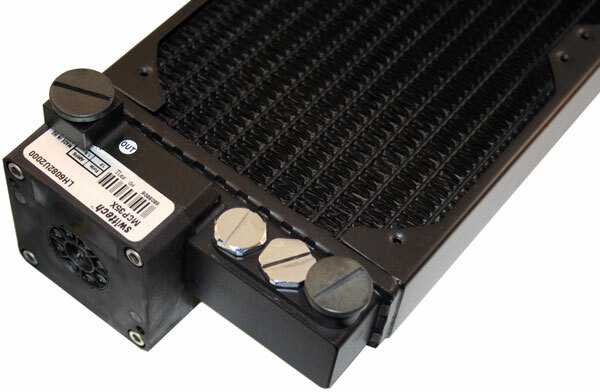 The patent pending integrated pump and built-in reservoir of the MCR Drive heat exchanger combine 3 of the 4 typical elements found in conventional CPU liquid cooling systems. Only the water-block(s) will need to be changed in case of platform upgrade. 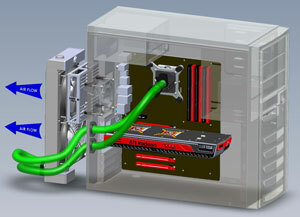 Future-proof concept reduces the cost of ownership over the long term, and guarantees that the core cooling system can be migrated from one computer to another. 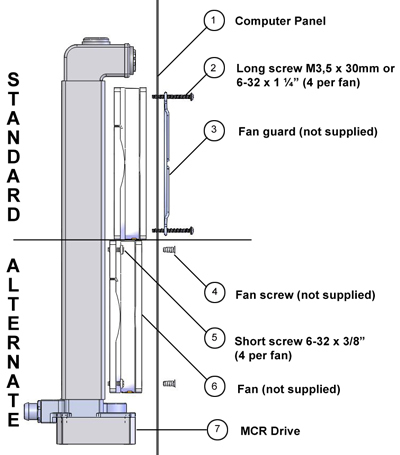 Performance curves of the radiators are similar to their respective non-integrated counterparts, the MCRX20 QP series and can be accessed in the links provided below. It should be noted that overall system pressure drop is noticeably improved compared to a traditional setup comprising a separate pump and reservoir due to a substantial reduction in the length of the flow path, as well as in the number of fittings (2 fittings instead of 6). For real-life performance data, you may also refer to a couple of white papers we recently published entitled "Actual Influence of Flow Rate on system Temperatures" and "Dual Loop versus Single, the Facts". 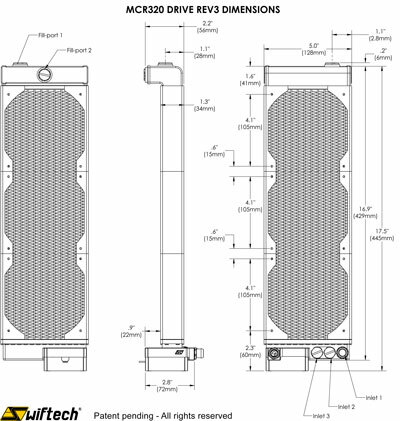 These articles contain comprehensive information with respect to the thermal performance that can be expected from the MCR-Drive serie heat exchangers when coupled with other Swiftech® components in the loop. Here is a summarized table of results; these tests were performed with Ci7 920 overclocked to 4.1Ghz and running at 1.39v; please also refer to the articles linked above for full configuration details, results and explanations. 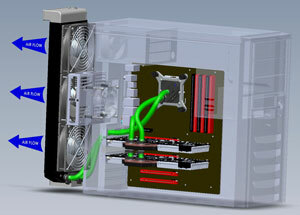 T CPU Air °C: the difference in Degrees Celsius, between the temperature of the CPU and that of the ambient air. 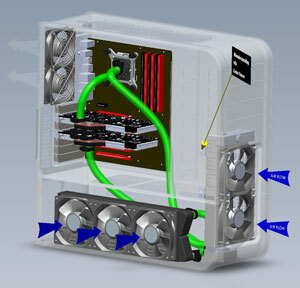 This presentation of the data identifies the CPU temperature independantly of ambient air temperature which varies greatly depending on local conditions, thus reflecting the true performance of the cooling system. We scouted the web and various forums to identify cases that are compatible for preferably "bolt-on" internal installation, or with very minor modifications; we also contacted various case manufacturers and inquired which of their models would be compatible. Here is a compilation of what we found at the time of this publication; please note that the (*) next to the listed models denotes that they were either validated by us, or listed as compatible by their respective manufacturers. We do not guarantee the accuracy of the provided information for models that we have not validated in house. 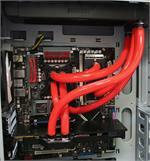 Powerful and compact 12VDC in-line pump for liquid cooling systems, with PWM control. Equipped with the highest performance after market top.